Information about support and infrastructure in Nantes in case of a second wave of expulsions in La ZAD, NDDL in so-called France. Originally published by Indymedia Nantes. Translated by Enough is Enough. 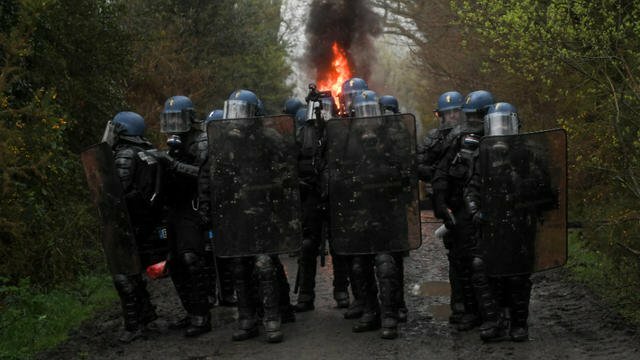 After the “pseudo” truce and project study phase concerning NDDL’s ZAD, a second wave of expulsion is planned. In reaction the B 17 info point in Nantes resumes service! The info point will be opened from 10 am every day at 17 rue Paul Bellamy (B17 Nantes) for the reception, monitoring, retranscription of information during the expulsion phase. – A place of rest and organization. The first night after the start of expulsions, there will be a gathering at 18:00 (06:00pm) in front of the prefecture of Nantes for a demonstration against ALL expulsions followed by a General Assembly at 20:30 at B17 to define actions to be carried out during the following days. #ZAD #NDDL French media indicate that the 2nd wave of expulsions will start tomorrow May 17 – Enough is Enough!